Age & Dementia Friendly Cape Ann takes intentional steps to create a supportive, welcoming environment where all residents, regardless of age, gender, ethnicity, health status, or socio-economic background can thrive. Engaging with a broad coalition of stakeholders to strengthen community supports and increase inclusion for people of all ages and abilities. Why Age & Dementia Friendly Cape Ann? can make adjustments in order to best accommodate these demographic shifts is now. This will be a permanent demographic change and impacts residents both today and in the future. 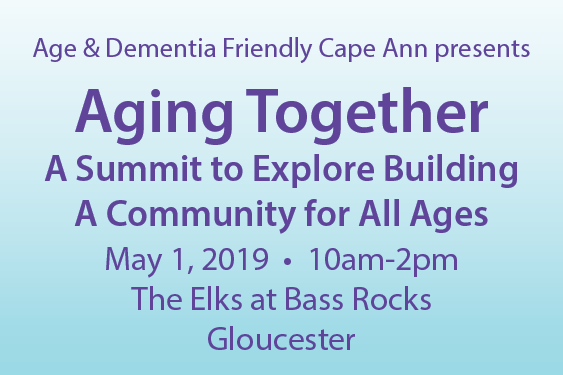 Age & Dementia Friendly Cape Ann invites Cape Ann residents to share their views on how their community can become more age and dementia friendly and improve programs and services for all residents. Support for this initiative was provided in part by a grant from Tufts Health Plan Foundation. Support for the initial community assessment was provided in part by a grant from The North Shore Community Health Network. Marketing materials for Age & Dementia Friendly Cape Ann have been produced from a grant awarded to the Massachusetts Councils on Aging by the Massachusetts Executive Officer of Elder Affairs and Department of Mental Health.